In John 10, Jesus speaks to his disciples in parables, but many did not understand. John 10:10 is a comparison between false teaching and the truth. The false teachers are being described as the thief, and Jesus uses the three actions that are can be associated to a thief to express the degree of the damage that these false teachers are causing. Perhaps we don’t often associate killing and destroying with a thief – stealing makes sense, but perhaps killing and destroying would be more commonly associated with a murderer. Perhaps Jesus meant the term in a metaphorical way, and the villainy of a thief certainly can be associated to the villainy of a murderer. Steal: A thief steals, of course. That would be his livelihood. His main act. 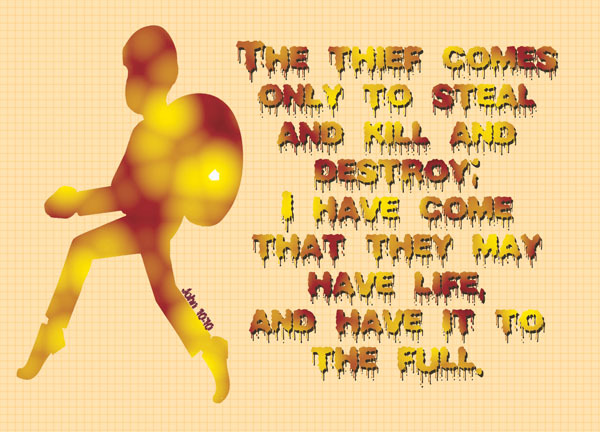 He steals not what is worthless, but he aims for the valuable, our treasure, things that are precious. A thief does not enter by the main door – he sneaks in by that unattended window, or that backdoor with the faulty lock. Similarly, false teachers who do not approach the doctrine with the right intention steals from us our hearts that belongs to God, and leads us to stray away from what is important. Kill and destroy – Some versions render the word kill as slaughter – and that may be a more fitting word in terms of the degree of intensity involved. It could be a literal or metaphorical term – the literal deaths of the saints, the apostles and the followers of Christ – think Stephen, who was stoned to death when he angered the Pharisees by calling them a stiff-necked people [Acts 7:51]. Martyrdom was not yet common when Jesus said this though – so perhaps the metaphorical sense of kill have greater significance here – the false doctrine is deadly, as it is not true to the teachings of Christ, and not what God had intended as they have twisted the word, and thus, on top of not being able to help the followers, the teachings of the false teachers in turn become poison and leads the people down the wrong path. It was common that in those days, the burden of having to follow the laws put out by the Pharisees exhausted many, and was a potential killer of faith. That said, it is perhaps interesting to note that while Christ uses the analogy of the thief negatively in this verse, the same analogy of the thief has been used positively by the apostles in more than one other occasion, describing the Lord’s second coming will be as unexpected as a thief [1 Thes 5:2, 2 Peter 3:10]. Jesus was never one to discriminate against certain groups of people, be it thieves or tax collectors or those with leprosy. I don’t think he used the analogy of thieves to demean them or anything like that. Judas was a thief [John 12:6], but still he became a disciple of Jesus. Let the thief no longer steal, but rather let him labor, doing honest work with his own hands, so that he may have something to share with anyone in need [Eph 4:28]. Life to the full: Jesus came to give his body, his flesh, his human nature so that we can have eternal life [John 3:16]. Christ came and was crucified so that we are redeemed and can have salvation. Remember the analogy. Unlike the false teachers, Jesus was a real teacher of the truth, He is the way, the truth and the life [John 14:16], and he comes not to steal but to give, not to take our lives but to give us a new life, not to destroy but to create and see us prosper [Jeremiah 29:11]. He came to give us life, and not just that – it’s life to the full, life in abundance. We’re not just promised a spiritual, Christian life with eternity – we have also been given the abundance of grace in which joy, peace, love, hope, faith and all that comes together. It’s all in a package. Buy one and get everything free – but the thing is, we don’t even need to buy. It’s all entirely given to us. This is easy to say – be careful of false teaching, but extremely hard to do. How can you tell if it’s false teaching or not? There’s only one way. You can only know if you’re familiar enough with the word of God. In my sometimes doggedly blind pursuit of Biblical knowledge I refer to and study from a variety of sources, and sometimes I hear or read things that two scholars/preachers said that are absolutely in conflict with each other. That would prompt me to study the context in greater detail, but at times I wonder to myself – if I had only heard one of them without hearing the other, I would have easily taken the teaching as the truth. I don’t know how you discern, but personally, I’ve been taught that we cannot use a single verse to explain the entire Bible, and instead we should use the entire Bible to explain a single verse. I’ve written about my studies on quite a number of verses thus far, and a verse can certainly be interpreted in countless of ways – but perhaps the most important thing is that it must not go against the teachings of Christ. Maybe my studies in this blog are false studies (I wouldn’t call these posts ‘teachings’) – I’m certainly not at the stage where I can use the entire Bible to explain a single verse (my knowledge of the Bible isn’t that profound yet), thus there are bound to be things that are lacking in my studies. It’s up to you to discern and to decide. Refer back to the Bible. False teaching steals, kills and destroys. As much as we are wary of false teaching as we listen to the teachings of others, let us also be wary in our pursuit of Biblical knowledge, that we do not in our carelessness become false teachers or share false teachings, lest we stumble others and partake in the theft, murder and destruction of God‘s beloved people. A very wise teacher of the Bible will not tell you to take his word for what he says is there but will encourage study and discernment of the part of the student and in my experience, we are all students. I think you really nailed this one. Very good. I agree about not taking everything a preacher says for the exact purpose it was intended. I believe you can like a preacher and MOST of what he says and yet still disagree on some things. It does not mean you need to find another church if it is one or two small things. Go back and study it for yourself. You did a good job…thanks for sharing.